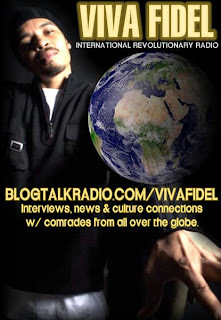 More than an emcee, Fidel has effectively used HIP-HOP as a vehicle internationally for political and social change. He understands the popularity of Hip Hop and has been favored to be well accepted in the art of emceeing, without compromising meaning or flavor. Music with substance has become a method of delivering important messages to our youth, especially in his strong hold of Milwaukee , WI. According to statistical information on Wikipedia, Milwaukee maintains Milwaukee Public Schools (MPS), the largest school district in Wisconsin and one of the largest in the nation. Statistically MPS has one of the highest dropout and suspension rates in the country among Black & Latino students. This is why Fidel has created two community institutions: The SUMMER OF PEACE and HIP-HOP SOCIAL CLUB, both which serve the Milwaukee Area as intervention programs that empower youth with multi-media training, and violence prevention education. Fidel's has garnered street credibility by dedicating his time to community development. Recently, his hard work and efforts were recognized when he was awarded the, “Wisconsin Giraffe Award” which is given by The Wisconsin Council of Family and Children honoring nominees who “stick their necks out” and make profound sacrifices for our children. He doesn't stop there. He facilitates his motivational workshops on college campuses and schools fusing hip hop culture and education. This is a combination necessary to win the hearts and appeal of the youth. Fidel also has several business ventures that help platform and compliment his career.